The M and R Series Commercial Walk-Behind Mowers address primary customer needs of productivity and operator comfort. The redesigned controls feature improved hand position, control grips with recessed operator presence levers and spring-loaded neutral locks. 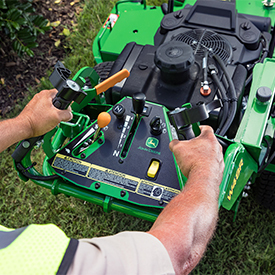 Improved weight distribution and position of hand controls make it easier to raise the front end of the mower, ideal for curb-climbing applications. The recoil start M Series line features speeds up to 6.5 MPH and 4 inches of ground clearance, while the electric start R Series line provides ground speed of up to 7.5 MPH and up to 8.5 inches of ground clearance.